HOLLOMANAIR FORCE BASE, New Mexico ? Being awell-dressed suborbital space traveler translates into style as well as safety. OrbitalOutfitters strutted out the world?s first commercial spacesuit here at the XPrize Cup festivities ? their approach to solving the engineering, safety andmarketing appeal of an emergency crew suit. Dubbed theIndustrial Suborbital Space Suit-Crew (or IS3C for short), the garment waspresented in catwalk-like fashion, a first generation prototype that OrbitalOutfitters envision as the new free-fall collection of apparel. 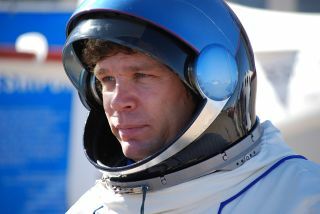 Jeff Feige,Chief Executive Officer for Orbital Outfitters, was master of ceremonies forthe space suit?s debut. He noted that the lines are getting longer for thosemaking reservations to fly aboard the first suborbital spaceliners. ?Ourmission is to provide low-cost, industrial quality spacesuits and relatedservices to companies providing commercial and government space travel,? herelated in a press statement. The idea isto create a high quality IS3C system for space flight crews. Orbital Outfittersis implementing a leasing arrangement for the suit to help contain up-frontcosts for customers. An array ofnew technologies has been incorporated in the IS3C suits. Modern fabrics aswell as special materials let ?sweat? out while still maintaining a pressurizedenvironment. Paraded onstage, the suit has all the needs of the more fashion conscious among us ?melding style and function, but also a bit retro in appearance. Customers don?tjust want to know they are safe, but they want to look good as well, pointedout officials from Orbital Outfitters. And the helmet comes complete witheasy-to-use visor too. Whilelooking smart in space is one thing, the IS3C is no toy. It is crafted to keep thewearer alive in the event of a cabin de-pressurization during a suborbitaljaunt. The outerlayer of the suit has been designed to be customizable to the needs of thecompanies ? that is any select color of a commercial suborbital flightoperator. OrbitalOutfitters has its first customer ? XCOR Aerospace in Mojave, California, an entrepreneurial up-startdelving into rocket powered vehicles for private consumer space travel. ChrisGilman, Chief Designer of the new suit pointed out: ?We are already designingsome very cool spacesuits for our customers that go well beyond even the IS3Cin their design elements. After all, we not only have to be able to save aperson?s life in an emergency, we have to make him or her look and feel good atthe same time.? Still, onefemale in the audience that?s already plunked her money down for a suborbitalflight commented: ?Safety is one thing?but it?ll make me look big. ?